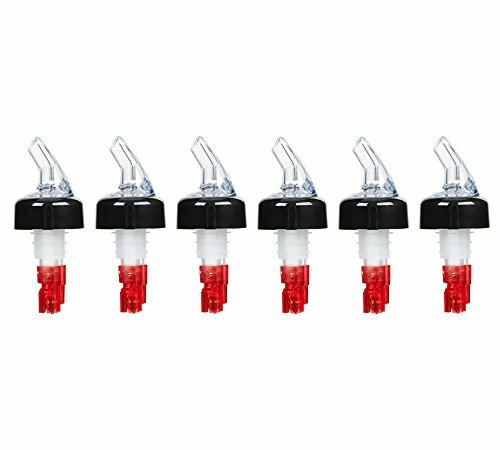 (Pack of 6) Measured Liquor Bottle Pourers, 1 oz, Clear Spout Bottle Pourer with Red Tail and Black Collar, Measured Pour Spouts by Tezzorio by Tezzorio Bar Supplies at Verve Wine Bar. Hurry! Limited time offer. Offer valid only while supplies last. HOW TO POUR A MEASURED VOLUME OF LIQUID: Step 1 - Before using the pourer, soak it in warm, soapy water for 10-12 minutes, then rinse in cold water. This 1 oz pourer is an effortless way to reduce overpouring and spills thus saving an additional two to four drinks per bottle. It means that our measured liquor pourer will pay for itself in just one bottle. Two ball bearings, for a controlled, smoother, more accurate pour. Bottom design that ensures that the ball bearings will never fall into the bottle. Pourer is made out of durable virgin food grade plastic and will not corrode. Can be fitted on standard 750 ml liquor bottles. Also can be used with juice, syrups, and oils. Note: inaccurate pourers will occur when used with water. If you have any questions about this product by Tezzorio Bar Supplies, contact us by completing and submitting the form below. If you are looking for a specif part number, please include it with your message.